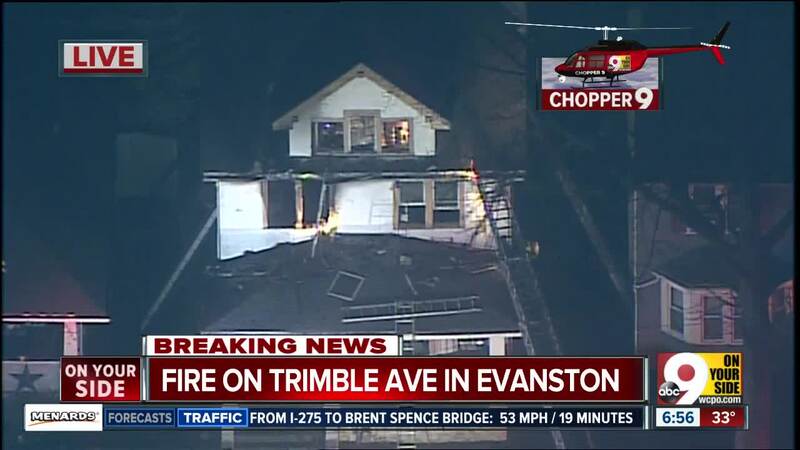 Five people were displaced after a house fire in Evanston on Tuesday, March 19, 2019. CINCINNATI -- Five people are displaced after their Evanston home caught fire Tuesday morning, according to the Cincinnati Fire Department. The house, located at 3324 Trimble Avenue, caught fire before 6:26 a.m. Everyone inside was able to get out before firefighters arrived. First responders transported one person to a hospital because they were having trouble breathing. The fire went up to the third floor of the home, and officials estimate the fire caused $50,000 in damage. The cause of the fire is under investigation, but officials believe the fire was caused by a candle. The American Red Cross is helping the people who are displaced.